Ethics board members Charles F. Chiusano and Kevin Johnston listen to Kimberly Knox, lawyer for Katharine L. Wade. A lawyer for Insurance Commissioner Katharine L. Wade told state ethics officials Thursday that the commissioner will recuse herself from any role in approving the acquisition of Cigna by Anthem, a deal now jeopardized by a federal antitrust lawsuit. Kimberly A. Knox, a lawyer retained by Wade, said the commissioner denies having any conflict, but her role has become so “highly politicized” that she will play no further role if the state resumes a review it suspended after the Department of Justice filed suit. Knox addressed the Citizen’s Ethics Advisory Board as it considered whether to formally begin a hearing process that allows state ethics attorneys to compel Wade and others to turn over documents in an effort to determine whether Wade and her husband would profit from the consolidation of two major U.S. health insurers. 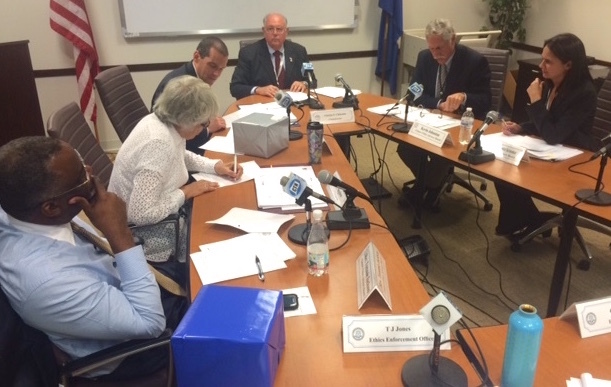 The board voted unanimously to name two members, Kevin P. Johnston and Dena Castricone, as hearing officers in the case. Their immediate task would be to personally confirm with Wade the extent of her recusal. It was unclear if the board would pursue further financial information from Wade and eventually adopt a declaratory ruling resolving whether Wade had a conflict under the ethics code. Her recusal may render the matter moot, they said. With two vacancies and the expiration of two member’s terms, the ethics board will lack the six members required by state law to conduct business at the end of the month. Unlike other state commissions, ethics board members are limited to a single four-year term. Knox told the board that Wade believes she has responded to all the requests for documents sought by Barbara Housen, the general counsel to the ethics board. “There is full transparency by the commissioner,” she said. The lawyer said the ethics board has no jurisdiction to issue a declaratory ruling, because the Insurance Department suspended its merger review after the Justice Department filed its antitrust action. “Those events themselves should have concluded this matter, because under the statute – the statute is your code of ethics – under the statute a public official has to be required to take action as an initial premise for making a conflict of interest analysis,” Knox said. Common Cause petitioned the board to issue a binding declaratory ruling on whether Wade has a conflict. Wade was employed by Cigna from 1992 to 2013, rising to vice president of government affairs, the company’s chief lobbyist. Her husband, Michael T. Wade, still works there as associate chief counsel for litigation. She says she holds no shares of Cigna stock, having divested it in April 2014. Her recusal is voluntary and an admission of no conflict, just an effort to end a “fishing expedition,” Knox said. On Tuesday, Gov. 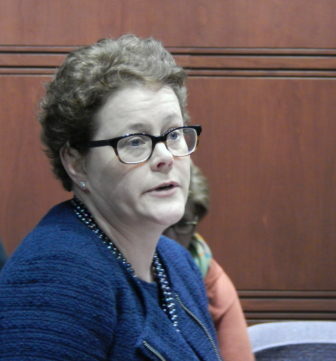 Dannel P. Malloy said he viewed Wade as being “fully compliant” with state ethics laws, but the administration would not appeal in court if the ethics board concluded in a declaratory ruling that she had a conflict. Critics of Wade suggested closing the case would be premature. 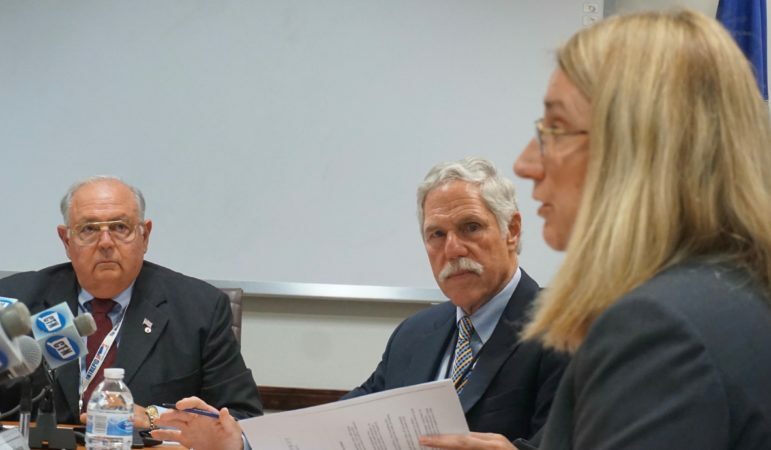 Tom Swan, the executive director of the Connecticut Citizen Action Group, urged the board to continue its inquiry and resolve the question of whether Wade has a conflict or violated ethics rules since Anthem and Cigna went public with the acquisition proposal. He noted that Wade earlier had insisted she had no Cigna business before her – the merger application was pending in her department, but it had not come to her for a decision – when her husband did exercise stock options. After the meeting, Swan said he was not surprised by Wade’s recusal. “I was wondering what rabbit the commissioner would try to pull out of a hat not to have a real review,” Swan said. Johnston, a former state senator and auditor, made a public appeal at the end of the meeting for the appointing authorities to fill vacancies on the board so it can continue to function past Sept. 30, when the terms of the Rev. Tommie Jackson and Daniel M. Young expire. Both are appointees of the governor. House Speaker J. Brendan Sharkey, D-Hamden, and House Majority Leader Joe Aresimowicz, D-Berlin, have had vacancies to fill since last September. Each has said they chose members, only to see their nominees withdraw because of the restrictions placed on board members. The nominees had applied for state employment, which disqualified them from serving on the board. From left, Tommie Jackson, Mary Bigelow, Daniel M. Young, Charles F. Chiusano, Kevin P. Johnston and Dena Castricone of the ethics board.